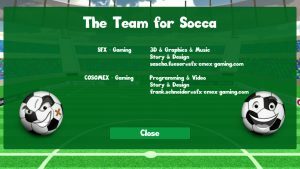 The Game Socca is about a little football named Socca, who has the dream to escape the soccer fields. 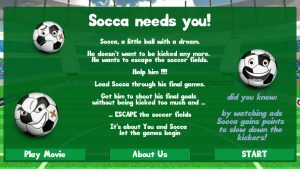 Help Socca to escape the soccer fields by scoring his final goals. 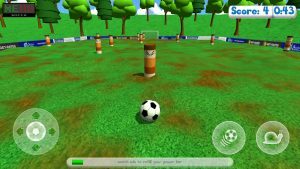 In the game you can use the control element to steer soccas movement. For each game you have one minute time to score four goals, with each goal scored you will receive a little extra time. Score 12 goals to get to the next level. Your process will only be saved if you score at least four goals. Try not to be kicked by the players on the soccer field. 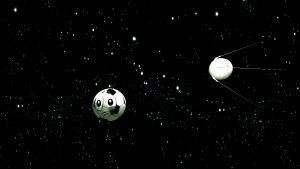 If the players kick Socca too hard, socca will be kicked to the universe. Help Socca to escape from the football fields and lead him through all levels. Just click Play and let the games begin! 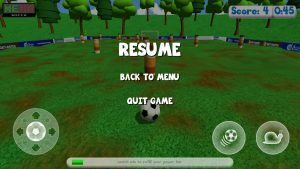 To be able to play the game Socca on your device you need to download the game to your device. Now you just need to click the ‘download button’ on the top left to download the app to your iPhone or iPad. Wafter a quick installation process you will be able to open the game by clicking the ‘open button’ on the top left. When opening the Socca game the first time a short intro video will be displayed. After the video you will be directed to the Main Menu. Now you just need to click the ‚install button‘ on the top right to start the download and installation of the app. After a quick installation process you will be able to open the game by clicking the ‘open button’ on the top right. 1.1 Play: If you click on the ‘Play button’ you can start to play the game. Level: On the top of the screen you can see which Level you are currently Playing. The Name of the Level will be displayed. 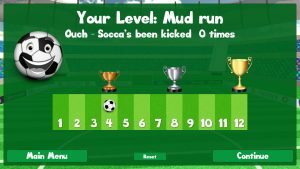 Number of times being kicked: Below the level name you will see how often Socca has been kicked. Score: You will find a score bar with the different cups on top. Here the little football icon marks how many goals you have scored. 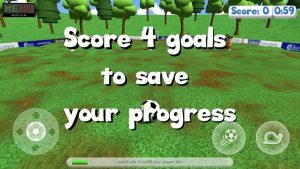 After every four goals your score will be saved, these steps are highlighted by the cups displayed on top of the score bar. You need to score four goals to save your score and you need to score 12 goals to enter to the next level. Main Menu: If you click on the ‘Main Menu button’ yo will be re-directed to the Main Menu of the game. 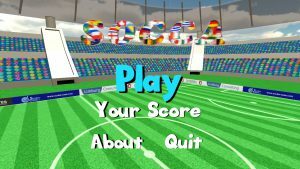 Reset: If you click the ‘Reset button’ all your scores will be deleted and you have to start again in the first level. Continue: If you click the continue button you will be directed back to the game. 1.3 About: If you click the ‘About button’ in the Main Menu you will be directed to the About Page of the App. On the About Page you will find a short tex about the game story. Additional You will see a hint about how the power bar functions work. Play Movie: If you click the ‘Play Movie button’ you will be able to watch the intro video of the game again. About Us: If you click the ‘ About Us button’ you will be directed to the About page of the game. Here you will find all information of the Developer Team of the Game. Start: If you click the ‘Start button’ you will be directed to the Main Menu. 1.4 Quit: If you click the ‘Quit button’ you will leave the game. The Main Menu icon is displayed on the top left of the screen. If you click on the menu item during the game, the game will be paused. You can click on ‘ Resume’ to get back to the game, click on the ‘back to menu’ to navigate to the main menu or you can leave the game by clicking ‘quit game’. The scoreboard is displayed on the top left of the screen. Here you can see how many goals you have already scored. Remember your progress will be saved after every 4th goal. You need to score 12 goals to get to the next level. Next to your score you will find the game time displayed. For every game you have one minute time. On the left side of the screen you will find the control element of the game. You will use this element to steer the direction of the socca ball in the game. To get the best game experience hold your device in horizontal format and use your left hand to steer the ball with the control element. Just place your left thump in the middle of the control element and move it in the direction in which you want to steer the ball. Power Bar: The power bar is displayed on the bottom of the screen. You need the power bar to use the two different Power Bar Functions. If the power bar is filled, it is displayed in green. If it is empty it will be displayed in grey. You can refill the powerbar by watching Ads, so if you want to use the Power Bar Functions you will need to watch at least one full advertisment displayed in the game. After watching the ad you will be rewarded with a partly refill of your powerbar. Power Kick Function: To use the Power Kick Function you have to press the little icon with the football displayed on the bottom left of the screen. In the moment you touch this icon Socca will move fast and with strong power. This feature will consume your power in the power bar and cannot be used with an empty power bar. Snail Power Function: To use the Snail Power Function you have to press the little icon with the snail displayed on the bottom left of the screen. As long as you touch this icon the kickers will be slowed down. This feature will consume your power in the power bar and cannot be used with an empty power bar. 3.1 Unity Ads: When the game is started advertisement will be displayed before you can start playing. If you wish to skip the ad you can do this by clicking on the X-button on the top right of the advertisement, or depending on the ad displayed, you have to click the double arrow icon displayed on the top left corner of the ad. If you continue to watch the advertisement, you will have to close the advertisement after it has been displayed. If you watch the full advertisement, you will be rewarded with a refill of your power bar! You can use two different Power Bar Functions in the game to learn more about it read section 2.4 of the Game Manual. The developers are not responsible for any content displayed in the Unity advertisement. 3.2 Banner Ads: In the game we use the banners in the football stadiums to place advertisement. If you want to get more information about the companies displayed on the stadium banners please open our partner page (link will be inserted shortly). If you are interested to place your logo on our stadium banner, please send us an email to: frank.schneider@sfx-cmex-gaming.com to receive more information.